hellomagazine.com Princess Caroline's grandson made an adorable, rare appearance at the Monaco Grand Prix on May 13. Charlotte Casiraghi's three-year-old son, Raphaël Elmaleh stole the show during a rare public appearance at the Monaco Formula E Grand Prix in Monte-Carlo on Saturday. The Monaco royal, looking characteristically stylish wearing a crème pantsuit, stepped out for the event with her little boy, uncle Prince Albert and cousin Louis Ducruet. The royal family gathered on the podium stage at the Circuit de Monaco where the top three teams' drivers joined them. Raphaël looked adorable sporting vibrant red pants and a white button down shirt as he played with miniature racecars on the stage by his mother’s feet. Doting mum Charlotte, 30, kept a close eye on her little boy as he played beside a magnum bottle of G.H. Mumm. The mother-son duo appeared amused as they watched the winning drivers spray champagne on the podium. Charlotte welcomed her son with ex-boyfriend, Gad Elmaleh in 2013. The French comedian confirmed his split from Princess Caroline's daughter last May, while admitting, "We stay close. We are a family." Charlotte's attendance at the formula race follows her recent getaway with her current boyfriend Dimitri Rassam. The couple took their love to Italy for the La Biennale Art Exhibition in Venice last week. Charlotte and French actress Carole Bouquet's son were photographed cruising the canals of Venice on a boat, checking out art and holding hands during a romantic lunch at an outdoors café. 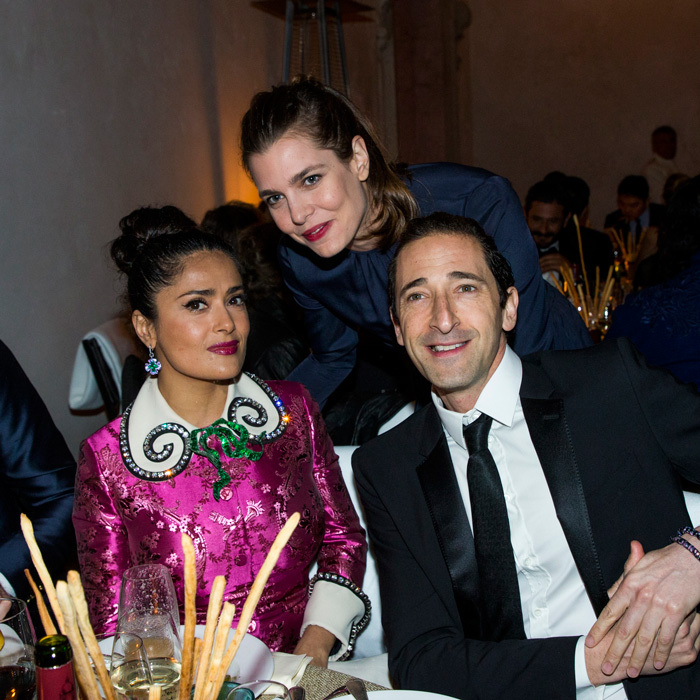 On May 10, the royal mingled with actress Salma Hayek and her husband François-Henri Pinault at the Cini party during the 57th International Art Biennale. Charlotte and Dimtri visited Jamaica and New York City together earlier this year. Back in 2015, Princess Grace Kelly's granddaughter opened up to the French magazine Philosophie about love saying, "I believe that the key to a long and happy relationship is when you both share a passion for the truth, for life."